Registered whitebait stand on the Turnbull River, South Westland. Lifted from the river in case of a flood. The Arawhata, Waiatoto, Turnbull, and Okuru Rivers are well known whitebaiting rivers. In this piece, we take a look at what is different about them, and some of the reasons why. Whitebaiting and the West Coast go together. I can’t think of one without the other immediately springing to mind. The pursuit of these little delicacies during the short two and a half month long West Coast season is part of the lifestyle and folklore of “true” Coasters! 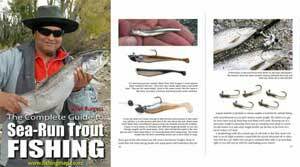 It is often said that for some whitebaiting fanatics chasing these translucent little fish isn’t a sport or a pastime; it’s a religion. If you have ever had the good fortune to lift your net to find a pudding of shimmering, wriggling, dancing whitebait, then it is easy to see how the whole experience can consume your life! Arawhata River looking upstream from the bridge on the Haast-Jackson Bay Road. 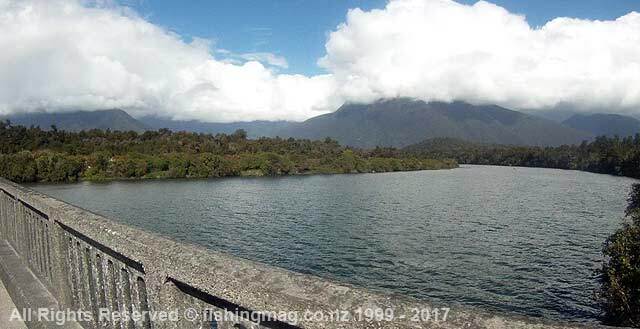 Anyone who has ever read about whitebaiting in New Zealand will know the famous names of the top South Westland rivers south of Haast, the Arawhata, Waiatoto, Turnbull, and the Okuru. Set in the isolated bush-clade wilderness a very long way from anywhere. It is 285km by road from Okuru to Hokitika, a journey of about three hours and fifteen minutes. Wanaka is closer at 157km, or just over two hours by car from Okuru. There is a garage and store at Haast (17km from Okuru), but you do need to be quite self-sufficient. Just being there is something very special. Waiatoto River looking downstream from the bridge on the Haast-Jackson Bay Road. The sea is about 900 metres from this point. On a single day in 1944, Des Nolan famously caught 130 kerosene tins of whitebait shingled handed in the Waiatoto River. With each tin holding at least 15 litres of bait that equals about two metric tonnes of whitebait. There are other good whitebait rivers, both north, and south. 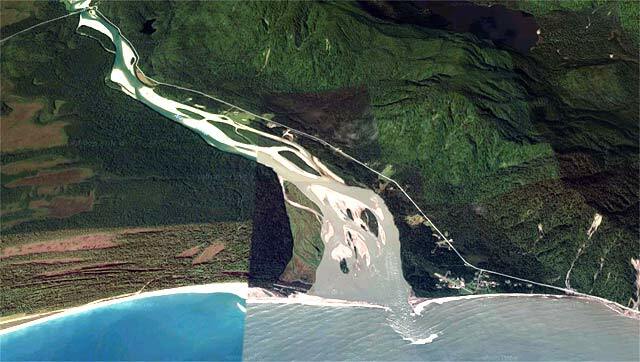 Those south of Jackson Bay like the Cascade, where commercial-scale whitebaiting takes place, are for all intents and purposes inaccessible other than by boat, fixed-wing aircraft, or helicopter. 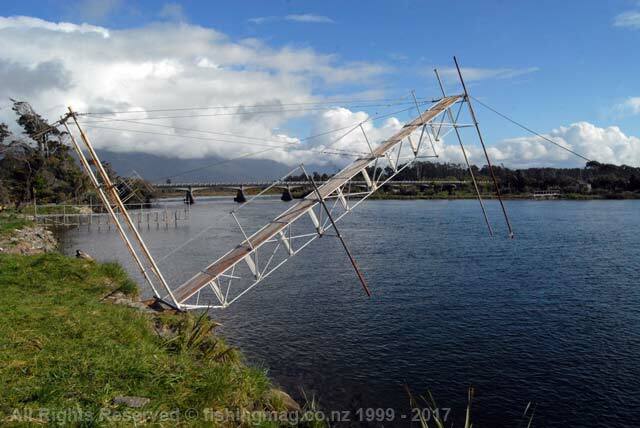 There are other notable whitebait rivers to the north like the Haast, Makawhio (Jacobs) with its many commercial stands, the heavily fished Hokitika, and the Taramakau, to name just a few. Most of the commercial whitebait stands are on the Waiatoto, Turnbull, and the Okuru Rivers. Waiatoto River looking upstream from the bridge on the Haast-Jackson Bay Road. It’s wild country in the back of there. Whereas the Haast and the Arawhata tend to run discoloured in the spring from melting snow, the Waiatoto tends to run clear and cold for most of the spring except for floods caused by heavy rain in its lowland swampy catchment. A higher percentage of banded kokopu are caught in the Waiatoto River which according to the late Ron McDowall is because banded kokopu don’t mind dirty brown water but they don’t like warm water. 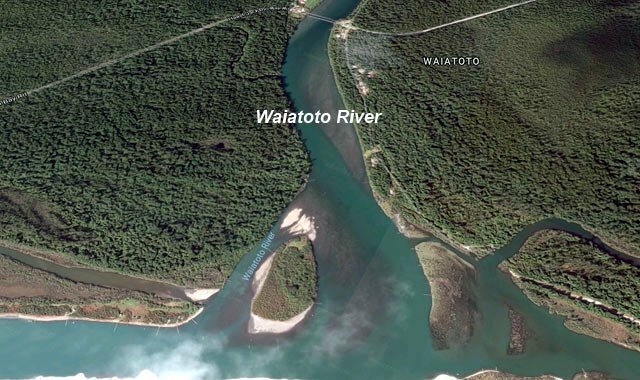 The Waiatoto River, although a top producer lined with registered stands along its banks in the tidal zone, it is unfortunately prone to severe flooding. This is mitigated to a fair extent by stands that can be lifted clear of the river but it is nonetheless a challenge to fish. Registered whitebait stands on the Okuru River. It can certainly be worthwhile for those up to the challenge. On a single day in 1944, Des Nolan famously caught 130 kerosene tins of whitebait shingled handed in the Waiatoto River. With each tin holding at least 15 litres of bait that equals about two metric tonnes of whitebait. Even at a very modest NZ$80 per kilo in today’s money (2017) that works out at a staggering NZ$160,000. Nolan’s Whitebait Cannery. Okuru River whitebaiting. Stands are lifted from the water with the aid of a block and tackle. The catchment of the Turnbull and Okuru Rivers is mostly coastal hills without the melting snow from higher up in the Southern Alps and so tend to run clear in the spring. These two rivers share the same mouth and are more stable than most. The Okuru River is the more productive of the two. It wasn’t until the 6th November 1965 that the road joining Haast and Ross were finally joined at Knights Point by roading crews working from both the north and south. Up until then a lot of whitebait was flown out by fixed-wing aircraft to Hokitika. 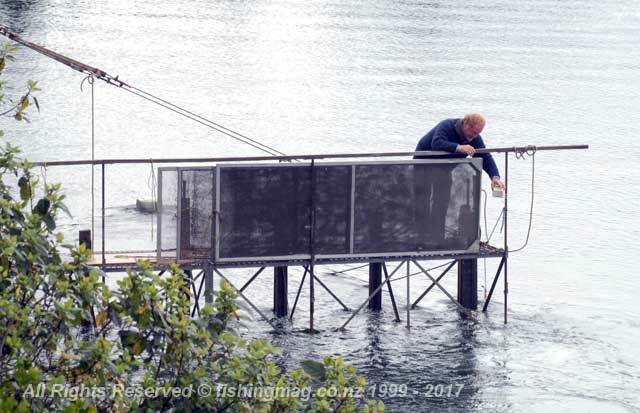 It would be kept fresh by placing the live whitebait into holding boxes in the river until the aircraft was ready to leave. Flying out the catch. By the 1930s whitebait was being canned at Karamea, Westport, Greymouth, and Hokitika. The Nolans were early settlers who lived at Okuru. There is even a Nolans Road at Okuru today. The Nolans opened their canning operation in an old cheese factory at Okuru in 1928. In a good season, they could can 40 tonnes (40,000 kg) of whitebait. Their best year was 1944 when they canned 60 tonnes (60,000kg). There was so much whitebait around that year that huge amounts were wasted and had to be dumped. Most of the canned whitebait was exported to Australia. Before the introduction of freezers and freezer trucks around 1950, there was just no other way than canning to prevent freshly caught whitebait from spoiling. 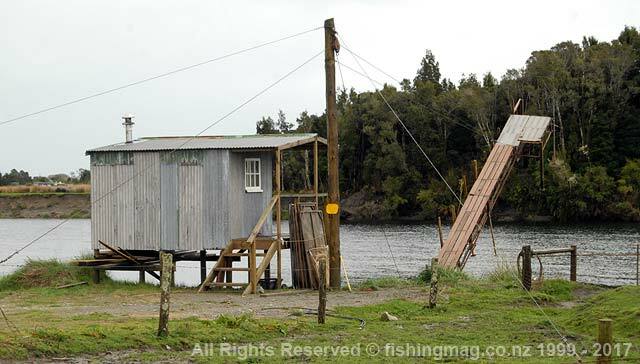 Upstream on the Okuru River, this is a typical South Westland registered whitebait stand setup. It is a marvel of engineering designed to be lifted from the water to beat a flood which could easily wreck a normal stand. The hut is also built on stilts and has some sort of wood stove. Photograph by Allan Burgess. Many of the whitebaiters who fish these hallowed rivers aren’t locals. Some travel from Southland, Otago, and Canterbury. Others must travel even greater distances to make their annual pilgrimage, so strong is their drive to return. The one thing they all share is the need make it to the “Coast” in good time to get their stands ready for opening day on the 1st of September. The season on the Coast ends on 14 November. The West Coast regulations allow for stands to be set up two weeks before the season starts, and two weeks for them to be removed once the season ends. The Department of Conservation manages the fishery through the Whitebait Fishing (West Coast) Regulations. 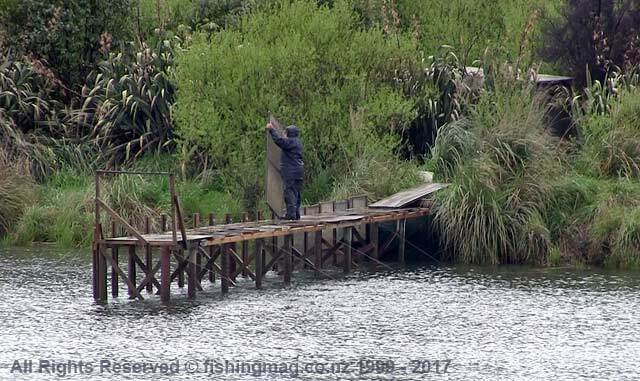 The West Coast Regional Council is in charge of resource consents authorising the construction and maintenance of whitebait stands on the Coast. South bank of the lower Okuru River. Many whitebaiters live in caravans for the duration of the two and a half month season. Whitebait stand on the Okuru River. This one doesn’t appear to swing up out of the water to protect it from floods. Arawhata River. Wide and braided in its lower reaches. Subject to big floods. can have good whitebait catches but these are sporadic. Similar in nature to the Haast River. Waiatoto River. Easily one of the best half dozen whitebait rivers in New Zealand. Consistent whitebait producer but tends to run dirtier than the Turnbull and Okuru. 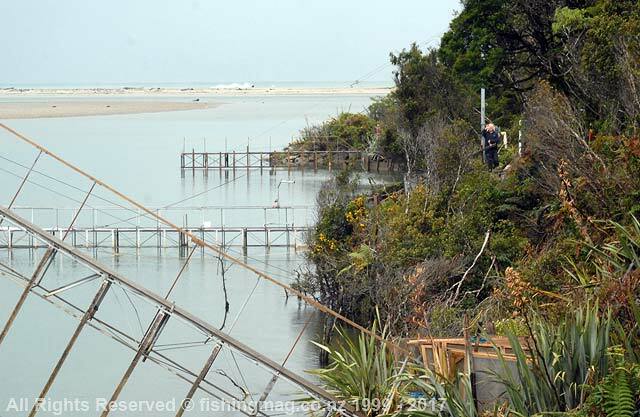 Can flood badly wiping out registered whitebait stands. Turnbull River. 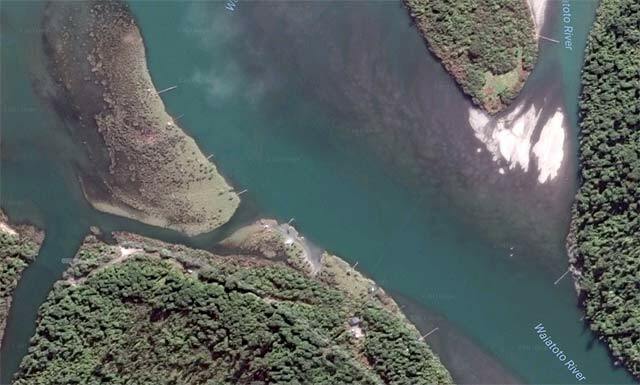 This river shares the same mouth and tidal lagoon with the Okuru River. More stable than the Waiatoto and the Arawhata Rivers. Okuru River. One of the all-time top whitebait rivers. Like the Turnbull River, the Ohuru has stable banks, produces good whitebait catches consistently, and is less prone to huge floods. You don’t see many non-commercial whitebaiters on these rivers. They are difficult to access and are situated in very isolated areas. 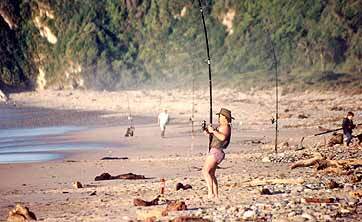 You can go whitebaiting there must stay at least 40 metres away from any registered stand. You need to be prepared for quite a bit of rain too. One other thing, did I mention the biting sand flies? 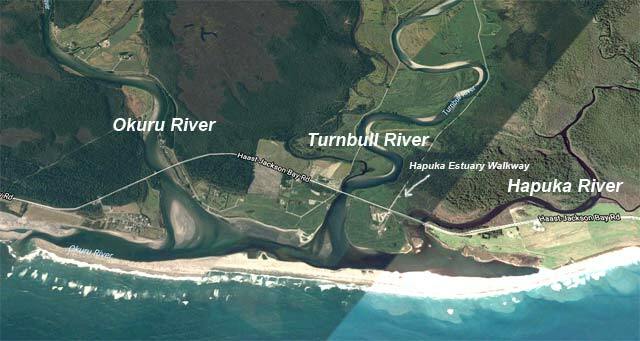 The Okuru, Turnbull and Hapuka Rivers all empty into the same coastal lagoon. The position of the mouth changes when there is a big flood. Note the Hapuka Estuary Walkway featured in another fishingmag article. Imagery courtesy of Terrametrics, DigitalGlobe, Google Earth 2017. The Waiatoto River mouth and lagoon. 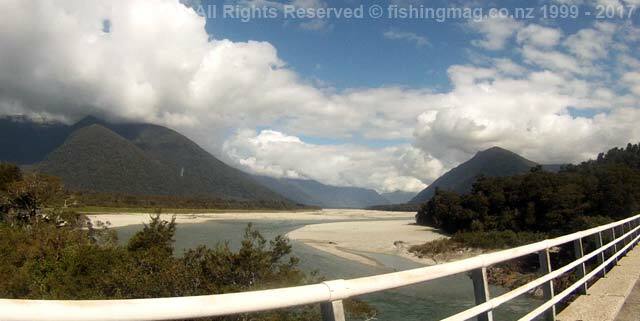 The Haast-Jackson Bay Road is approximately 2km from the sea. Note the whitebait stands many of which can only be reached by boat. Imagery courtesy of Terrametrics, DigitalGlobe, Google Earth 2017. View of the Waiatoto River near the tidal lagoon. You can make out some of the many registered commercial whitebait stands in this picture. The river mouth is to the top of the photograph. Imagery courtesy of Terrametrics, DigitalGlobe, Google Earth 2017. The Arawhata River with its much larger catchment is more prone to flooding and the water more likely to be milky. Imagery courtesy of Terrametrics, DigitalGlobe, Google Earth 2017. 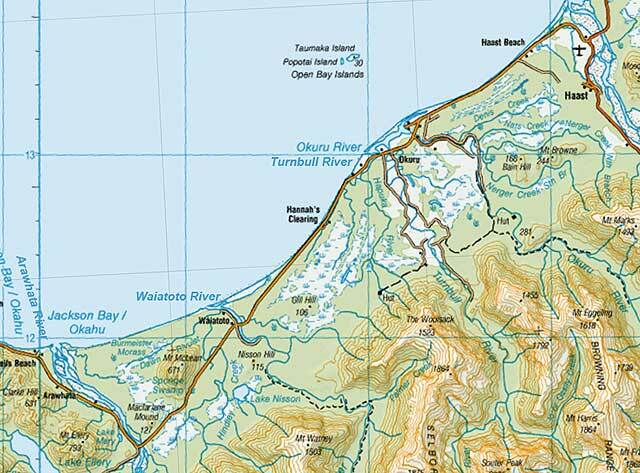 You can see from the map that the Arawhata River is wide and braided in its lower reaches very similar to the Haast River. Map sourced from LINZ crown copyright reserved.